Hey y'all! I know it's been a bit since I last posted, but I've been trying to get some spring cleaning done as well as celebrating the birth of my brand new nephew Gage Allen Randall! 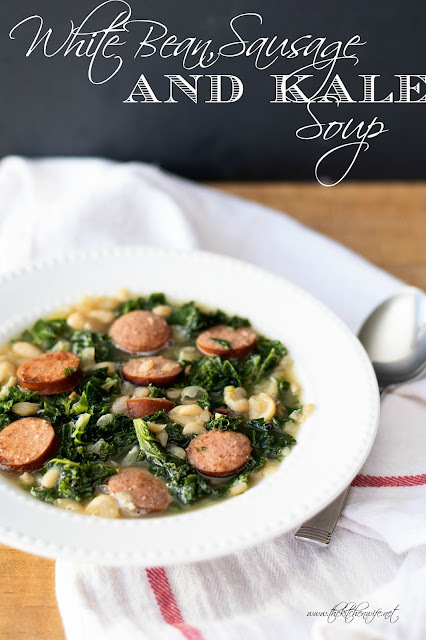 So as you can imagine, it's been a little busy around here, but I'm back, and I have a DELICIOUS new recipe for you, my Rainy Day White Bean Sausage and Kale Soup! Spring has finally sprung around here, and with that comes lots and lots of rain. It's funny because with the warmer temperatures I'm wanting fresher foods, but with all the rain, I just want a big bowl of soup to warm me up. That's why this Rainy Day White Bean Sausage and Kale Soup is perfect. Packed full of healthy components, but still warm and hearty! I can't wait to share it with you so let's get started! To begin you will place a heavy bottomed pot over medium high heat, and allow it to get hot. Add a couple tsp. of oil to the pot. Now add the sliced smoked sausage to the pot and let it brown. Once the sausage has browned, remove it from the pot, and add the onion. Let the onion cook until it is soft and translucent, about 2-3 minutes. Add the garlic to the pot and let it cook just long enough for you to smell it coming from the pot. Add the dried thyme to the onion and garlic. Then return the sausage to the pot. Bring the soup to a boil, then lower to a simmer. 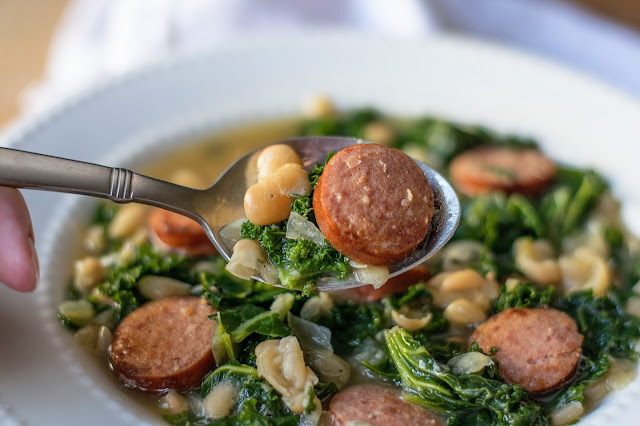 While the soup is simmering, stem and chop your kale. Then gently massage the kale. I know this makes me sounds crazy. I mean "MASSAGE THE KALE!?!" but trust me. Massaging the kale help to take out the bitterness. It makes a huge difference. Now add the kale to the soup and let it simmer for another 10 minutes. Just look at this glorious bowl! 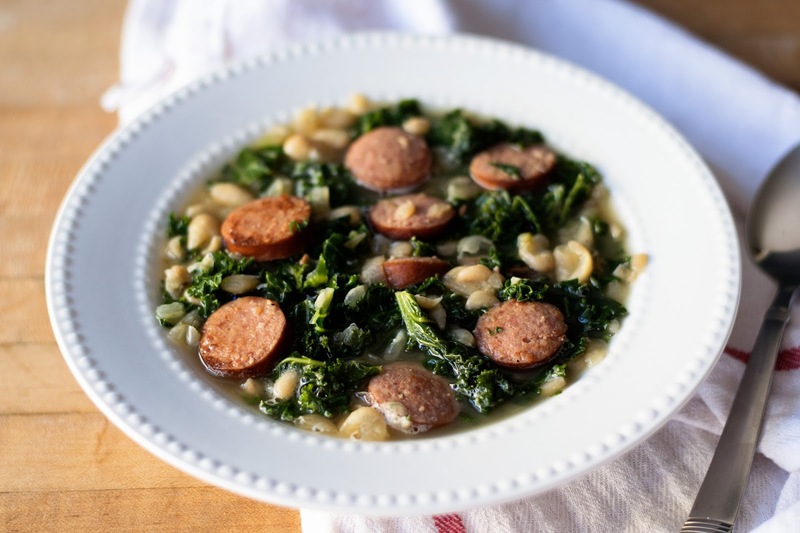 Fresh, healthy, this Rainy Day White Bean Sausage and Kale Soup is the perfect meal for ANY day of the week! I'm sorry, but I have to go in for a bite! I would love to hear about your favorite rainy day meals, so leave them in the comments section below, and be sure to get in the kitchen and give this Rainy Day White Bean Sausage and Kale Soup a try TONIGHT! You won't regret it! Place a heavy bottom pot over medium/high heat and allow it to get hot. Add 2 tsp of oil to the pot and the sausage. Allow the sausage to brown and then remove it from the pot. Add the onion and let it cook until it is soft and translucent, about 2-3 minutes. Add the garlic to the pot and cook until you smell it coming from the pot. Now add the dried thyme to the pot and return the sausage. Pour in the chicken stock and add the beans. Bring to a boil, and lower to a simmer. Cover and let simmer for 10 minutes. After 10 minutes add the stemmed and chopped kale to the soup and let it simmer for 10 minutes. This looks wonderful! No matter what the weather, I am loyal soup eater! I just may try this tonight! Thank you! And I would love to hear what you think!